From event host, to podcast producer, to content creator, to brand strategist, Valerie Smaldone takes her performance background and helps others to communicate their story effectively. Two decades as a top personality on highly rated music station WLTW-NY provided this industry leader with an incredible base for her present company. With over 2.5 million listeners per week, Valerie received 5 Billboard Awards, 6 Radio and Records Awards, 3 Metro Air Awards, and recognition from associations and not-for-profit and charitable organizations. Having performed on stage, in episodic television roles and in films, Valerie is a seasoned performer. She draws upon her wealth of experience as a broadcaster and performer, and coaches authors, chefs, executives, experts and physicians in presentational speaking skills and media training. Valerie is adjunct instructor at the prestigious School of Visual Arts in New York City. Hosting an industry event, a charitable function, a corporate seminar or awards ceremony, Valerie provides approachability, professionalism and warmth to every event she emcees. From authors to celebrities to experts to performers, Valerie covers the gamut. She has interviewed thousands of individuals from all industries. Valerie can provide the tools for a compelling interview in her "art of the interview" workshops and one-on-one coaching. Whether hosting on PBS and interviewing music celebrities like Bryan Adams, or working as a correspondent on television, Valerie brings a very real and personal quality to every broadcasting opportunity. Entertainment branding for podcasts and webisodes provides an efficient way to promote your product or service. VSMWW has developed content that has been hosted on radio, television and digital properties. 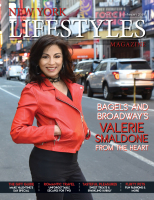 February 2019 Cover Story, "Valerie Smaldone: From The Heart."